As the U.S. fleet prepares to pass through the Panama Canal, Panama City becomes a city of spies. 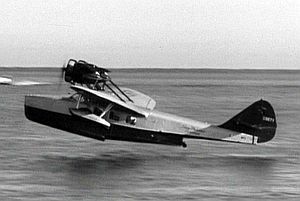 A seaplane load of suspicious characters lands in Balboa, arriving from Cristobal on the on the Atlantic side of the isthmus. Among the group are British novelist Clivedon Compton, Miss Sarah Finch, a schoolmarm from Chicago, sinister scientist Dr. Rudolph Grosser, cabaret owner Emil Manolo, singer Kathi Lenesch, tabacco store owner Achmed Halide, U.S. government engineer Richard Cabot, and American government agent R.J. Godley. 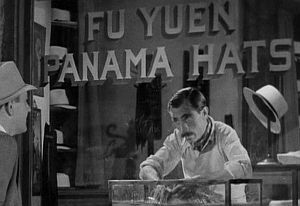 Upon landing, Godley goes to a Panama hat shop that is owned by Fu Yuen, who is actually Charlie Chan, working for U.S. intelligence. Godley, seeking Chan's help to identify and capture a deadly spy and saboteur known as Reiner, suddenly dies just as he was about to give the Oriental detective some valuable information. 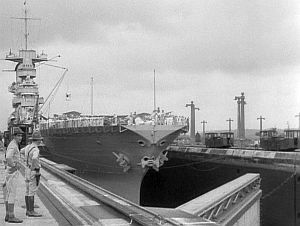 Chan must now work on his own to expose Reiner before the spy can sabotage the Panama Canal, thus trapping the U.S. fleet. Chan, still in the guise of Fu Yuen, is taken to jail because of the suspicious death of Godley in his shop, where he finds his second son, Jimmy, who has gotten himself arrested on suspicion of being a spy. Once out of jail, father and son work together to solve the mystery of Reiner's identity and save the fleet. 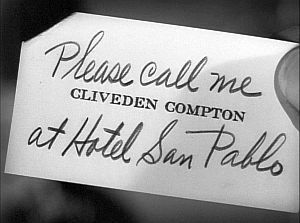 Two other suspects are killed; first Compton in his hotel room, and later, Manolo, who was on the run from the police. While searching for clues at a cemetery, Charlie Chan, Jimmy, Miss Finch, and Captain Lewis, U.S. intelligence officer, become trapped in a tomb. While in the tomb, a number of large empty cans are discovered. Chan determines that the cans contained a very high explosive, which he now feels will be used to destroy the canal. 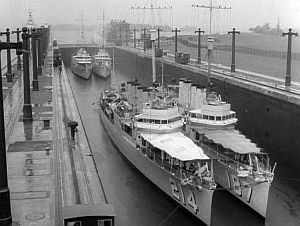 After hours of being trapped, the group finally makes its escape and hurries to the Miraflores locks which, Chan has determined, have been targeted for destruction at ten o'clock that night. As the hour of destruction approaches, all personnel at the Miraflores powerhouse are evacuated. Before the group of suspects can exit the facility, Chan stops them, holding them all at gunpoint. With each passing minute, individuals in the group become more overcome with fear. Finally, as the fateful moment arrives, the murderer, in a desperate attempt to escape, pulls out a gun. To the surprise of most everyone, Miss Finch reveals herself to be Reiner. As she flees through a door, she is captured by authorities who were waiting outside, obviously privy to the ploy of Charlie Chan, who had shortly before discovered, and disarmed, the explosive device. NOTES: Charlie Chan in Panama provides a glimpse at the stresses experienced by the United States in the stages that led to the eventual entry of our nation into World War II. 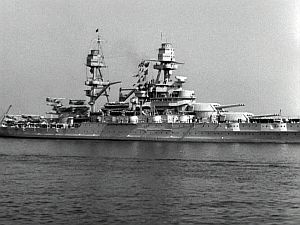 At this point, the United States was "neutral" in the war which had already begun in both Europe and in the Far East. We note the hints throughout the movie as to the identities of the hostile nations, although no definite references are provided in the interest of appearing neutral. 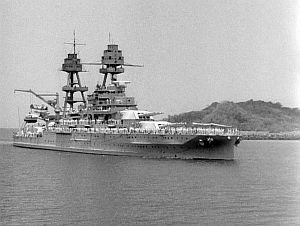 Film footage containing sequences of U.S. Navy warships, including the USS Arizona and USS Lexington passing through the Panama Canal, is seen in this picture. One enemy one too many. Absence of proof open cell door. Perhaps better to let cat out of bag than drown same. When prepared for worst, can hope for best. Young brain, like grass, need dew of sleep. Truth win more friendship than lies. Bad alibi like dead fish - cannot stand test of time. No heart strong enough to hold bullet. Gun can be made to talk. Marks left by gun barrel on bullet like fingerprints. Features familiar as markings on bad penny. Nerves make time crawl backward. Dividing line between folly and wisdom very faint in dark tomb. Precaution much safer than daring. Time bomb without electric arteries cannot speak. (Miss Finch: "Why, it's your son!") Features familiar as markings on bad penny. This latest Chan whodunit is a real chiller and ranks high among the many turned out. Picture definitely tags Sidney Toler as worthy of carrying on the role that the late Warner Oland made a screen fixture. There's less of that slow-motion delivery Toler showed before. He makes it a distinct characterization even in the face of alert competition from 'honorable No. 2 son.' Production has patterned for enough time on the screen to fill out a double-feature bill, where it will lend strong support. Exhibitor should not overlook the story's timeliness, centering about a plot to destroy part of the Panama Canal and trap the fleet going through on maneuvers. Added to this is a long array of continental spies. 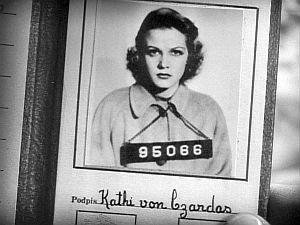 Scripters John Larkin and Lester Ziffren have skillfully fastened suspicion on six different characters and then made the discovery of the mysterious German spy, Ryner, the seventh and long-sought suspect. They have done this without permitting too much of it to seem unreasonable. Fable is vastly helped by Norman Foster's direction, former screen player apparently having won his spurs in directing. He has fashioned a whole series of suspenseful moments without making the developments seem ludicrous. 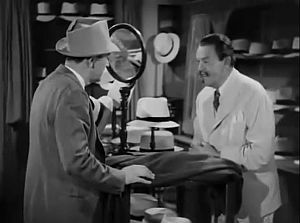 Toler dominates every scene once he's introduced working for the army intelligence disguised as a hat store proprietor. He is tremendously effectual in the well-conceived climax when the destruction of the canal locks seems to hang on his ability to force a confession from one of five suspects. Sen Yung makes the 'No. 2 son' character highly important. Jack La Rue, as a nightclub operator and one of the menaces, contributes probably his best recent performance. Frank Puglia, another suspect, is good. 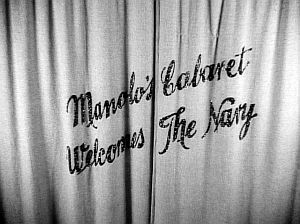 Jean Rogers, as the Czech refugee showgirl, adds a nice minor role while Mary Nash, as the supposedly innocent schoolmarm, chips in with a topflight portrayal. MISS FINCH'S STATED PROFESSION: "For eighteen years I've been teaching the students of Chicago the mysteries of algebra and geometry." 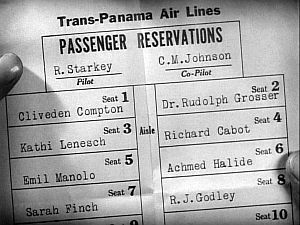 ACCORDING TO THE STEWARDESS DURING THE FLIGHT, THE TIME UNTIL ARRIVAL IN BALBOA: "...20 minutes..."
ACCORDING TO R.J. GODLEY, TWO CRIMES COMMITTTED BY THE SECRET AGENT "REINER": "...sabotaged the Eldredge Drydock...crashed the 409..."
ACCORDING TO CHARLIE CHAN, SON JIMMY'S SUMMER JOB: "...working as steward on boat during college vacation." THE REASON THAT JIMMY CHAN WAS SRANDED IN PANAMA: His ship sailed to New York without him as he was in jail under suspicion of espianage because of photographs that he had innocently taken. 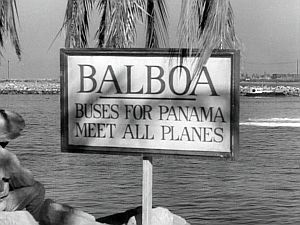 JIMMY CHAN'S DATE OF ARRIVAL IN PANAMA: The morning of July 15, as his boat had "docked in Balboa this morning." THE MILITARY DOCTOR'S STATED AUTOPSY RESULTS FOR R.J. GODLEY RELATING TO THE CAUSE OF DEATH: "Concentrated poison in both lungs." 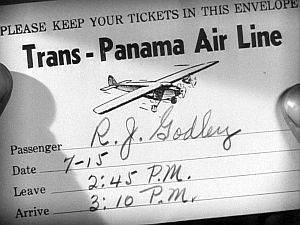 ACCORDING TO CHARLIE CHAN, REINER'S CRIME "SIGNATURE": "...unnusual method of causing death..."
ACCORDING TO COLONEL WEBSTER, THE PLANNED ARRIVAL OF THE U.S. FLEET AT THE PANAMA CANAL: "...in the next 18 hours..."
PANAMA CANAL LOCATIONS MENTIONED BY COLONEL WEBSTER: "...Cristobal at ...the Atlantic Gate." 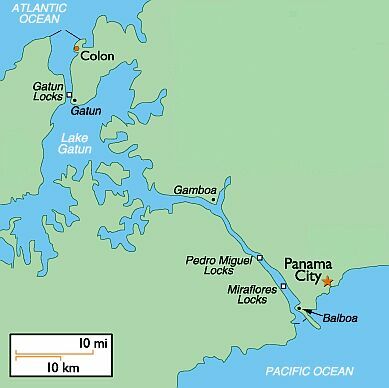 "(The fleet) ...must pass through the Gatun Locks, the Gaillard Cut, the Pedro Miguel, and the Miraflores Locks" (to reach the Pacific battle stations). THE AGE OF MISS FINCH, ACCORDING TO CHARLIE CHAN: "...young maiden of 50 summers or more." 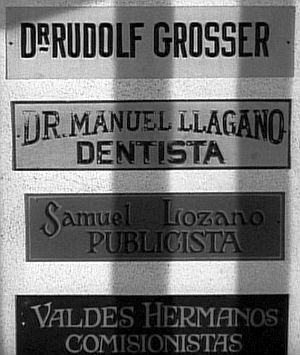 CHARLIE CHAN'S SHORT DESCRIPTION OF DR. GROSSER: "Vienese scientist." THE INFORMATION OFFERED REGARDING DR. GROSSER BY JIMMY CHAN TO HIS POP: "We studied Grosser in our biology class. He's an expert on tropical diseases and plagues." THE NAME OF THE BOOK FROM WHICH THE PAGE CONTAINING THE HAND-DRAWN MAP SHOWING THE "OLD PANAMA CEMETERY" CAME: "Henley's Guide to Panama"
THE TIME, ACCORDING TO COLONEL WEBSTER, THAT CHARLIE CHAN AND CAPT. WEBSTER HAT LEFT HIS OFFICE: "They left at eleven this morning." THE TIME AS NOTED BY CHARLIE CHAN WHILE INSIDE THE CEMETERY TOMB: "Eight-fifteen (p.m.)." 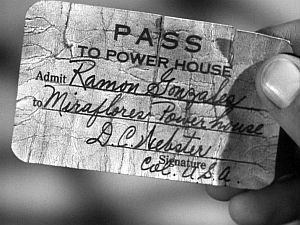 THE TIME AS SHOWN ON THE TIME BOMB AS CHARLIE CHAN AND RICHARD CABOT ENTER THE MIRAFLORES POWER HOUSE: 9:45 p.m. THE TIME AS THE MILITARY POLICE BRING MISS FINCH, ACHMED HALIDE, AND KATHI MENESCH INTO THE ROOM CONTAINING THE TIME BOMB TO BE QUESTIONED BY CHARLIE CHAN: 9:49 p.m. 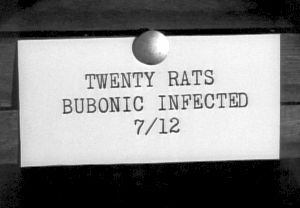 THE TIME AS CHARLIE CHAN DETAINS THE SUSPECTS INSIDE THE ROOM WHERE THE TIME BOMB HAS BEEN PLACED: 9:55 p.m. THE APROXIMATE TIME AS MISS FINCH IS REVEALED AS REINER: 10:00 p.m. 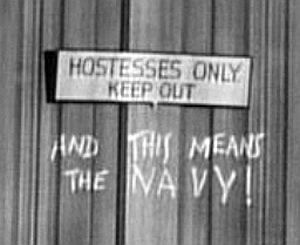 TITLE OF THE SONG HEARD DURING THE FINAL SCENE AND CLOSING CREDITS: "Anchors Aweigh"
Clivedon Compton: "Stewardess, when shall we be in Balboa?" blood and thunder novels - A term for popular adventure novels such as those in the pulp fiction realm. Miss Finch: "...like one of those blood and thunder novels you write." 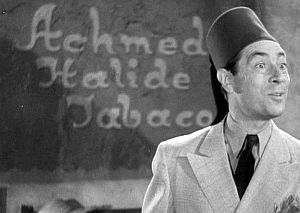 Charlie Chan: "Poison called boanide?" Stewardess: "Cablegram for Dr. Grosser." Governor D.C. Webster: "Here's our fleet, concentrated off Cristobal at the Atlantic gate." Military Police Officer: "That cuts no ice here." Richard Cabot: "This is no place for you; why, it's just a dive." dock - To withhold or deduct a part from one's salary or wages. Powerhouse Worker: Oh, they dock you, huh?" Jimmy Chan: "I have it all doped out." Governor D.C. Webster: "To reach battle stations in the Pacific, the fleet's full war compliment must pass through the Gatun Locks, the Gaillard Cut, the Pedro Miguel, and the Miraflores Locks." humidor - A container designed for storing cigars or other tobacco products at a constant level of humidity. Jimmy Chan: "Why, even this humidor has an English school emblem on it." Notation on the arm band of the Military Police Officer: "MP"
Jimmy Chan: "Boy oh boy! Why don't I think of nifties like that?" Miss Finch: "...I wondered if we could use a small portion of that nitroglycerin and blast our way out of here." 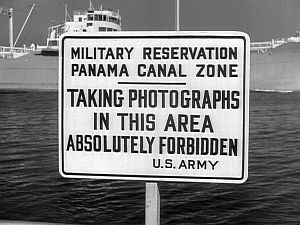 Sign: "MILITARY RESERVATION PANAMA CANAL ZONE"
Emil Manolo: "You know, you will like Panama City." R.J. Godley: "They tell me this fellow makes great Panamas." Sailor: "This girl here, she's trying to pump me about the fleet." Charlie Chan: "...must ask for rain check." screwy - (Informal) Odd or eccentric. Jimmy Chan: "Sounds awful screwy to me." it takes ships about nine hours to complete the crossing. y el alma muere de esperar. tu la dijiste ir vereda tropical. quiero besar su boca otra ves junto al mar.